Read on for our in-depth break down of the benefits of renting your furnace or central air conditioner vs buying your system outright. Your furnace has just died. Do you rent or own your furnace? If you own your furnace you are on your own. You are responsible to now begin searching, along with countless other people growing chillier by the moment, for a service company to come out. Keep in mind that if this happens outside of service hours (which it always does) you are now paying a premium for them to come to your home as an emergency. In addition to the cost of the technician to come to your home, you are now facing the cost of the actual repair, or in some cases, replacement. If you are lucky, you have thousands of dollars available in your bank account for such emergency situations, or if you are like the rest of us, this is your worst case scenario. Luckily there is a solution that can change this situation for the better. It allows any homeowner access to high efficiency heating systems with no money down. Sounds too good to be true? It isn’t! 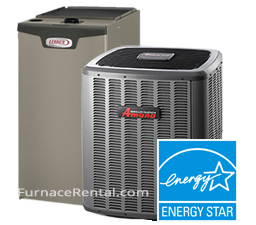 Let’s compare buying vs renting your furnace or air conditioner to see what’s right for your situation. The biggest factor in purchasing your furnace is the high upfront costs. In most cases, Canadians can expect to spend upwards of $3000 – $5000 including installation for a new high-efficiency forced-air furnace for their home or business. That’s a lot of cash to spend all at once. Rent to own on the other hand, requires no down payments or other upfront costs. The only thing you pay is a predictable affordable flat monthly rate, which makes budgeting much easier and avoids any large unexpected expenses. When it comes to high efficiency furnaces, the benefits can be seen on your monthly energy bills. By switching to high efficiency systems you are helping the environment as well as your wallet. Those who choose to rent their central air conditioner or forced-air furnace rather than buy outright, do however, see additional benefits. By choosing to rent rather than buy your system outright you can see many additional savings. Not only does a rental agreement include free standard installation with up to 15 feet of duct work, but it also includes free disposal of your old unit. That means that if you have decided to rent a new unit you will see absolutely no upfront cost. This is a great relief when you don’t have thousands in the bank to spend on a new unit or simply want the dependability of a predictable monthly energy cost. Do you think your less than stellar credit score will keep you from being approved? Unlike financing, renting your unit can be more flexible as long as you’re the homeowner. We strive to accommodate most homeowners and provide accessible high efficiency heat and lower monthly heating costs! When you rent your heating unit you don’t have to scramble when something goes wrong. Help is a simple phone call away with our 24/7 helpline (SIMON DO WE HAVE THIS?). If the issue requires a service technician to come to your home, you don’t have to worry about a hefty bill associated with the cost of materials or labour. You are completely protected by your low monthly fee. In addition, your agreement includes free yearly maintenance of your furnace. So you will receive a free annual ‘tune-up’ to lessen the chances of a mid snowstorm breakdown and keep your unit working as efficiently as possible. Booking your check-up is as easy as picking up the phone. If you run into a situation where your furnace cannot be repaired, it will be replaced for free. You never have to worry about the cost of replacing your system. It is all covered in your predictable monthly fee, which can be incorporated into your Enbridge Gas bill for easy payment. Not only does a new furnace make for a more energy efficient home, but it also makes your home more attractive when buying or selling. It’s easy to transfer the advantages of your rental agreement when a new owner buys your home. Business owners also enjoy the benefits of a reliable monthly energy cost when preparing their annual budgets. It helps to avoid sudden large expenditures and keeps the budget in check all year long. It also avoids the loss of work hours searching for repair or replacement furnace services. Instead repair or replacement is simple, straightforward and without additional cost. Renting is also a great choice for landlords. Not only are you upgrading your home to a more energy efficient heating system, but they are doing it without any upfront cost. By renting the unit, they are able to build that monthly cost into the rent. The tenant gets the advantage of lower energy costs as well as easy access to technicians in the event of any system failures. Renting a furnace rather than purchasing it does not disqualify you for government energy grants. By purchasing and installing a qualified furnace you can receive up to $250 from the Ontario government. In B.C. rebates are also available but you must schedule an energy audit before and after installation. In Alberta, incentives for HVAC are limited to business owners and non profits but the government recently introduced rebates of up to $1000 for tankless hot water systems. Why not give us two minutes to change your mind? That’s all it will take to get a FREE QUOTE over the phone. We can often schedule an installation for as soon as the next day. You have nothing to lose and a lot to save. Give us a call today toll-free at 1-877-785-1055.